Most printers at some stage in their life will have clogged print heads, this may take the form of poor print quality or no print showing at all. This can happen if a printer has been out of use for some time with no ink flowing through the print heads or similarly after inserting new inks into a printer that hasn’t been used for quite a while. One or more colour inks can be affected and printing a nozzle check an tell us which colour ink cartridge is causing the problem. The build up of hard ink on one or more colours is usually responsible for the poor print quality and it would be necessary to perform one or more head cleaning procedures to resolve this. Most people have never tried to clean the print heads and without an instruction manual its quite difficult to work out how to do this. All brands of inkjet printers are likely to be affected by this problem and this short tutorial video outlines in basic steps, starting with printing a nozzle check and taking you through the head cleaning process of an Epson home printer. It is well documented by several print manufacturers that it may be necessary to perform up to 5 or 6 head cleaning procedures one after another in order to clear a really stubborn head clog. 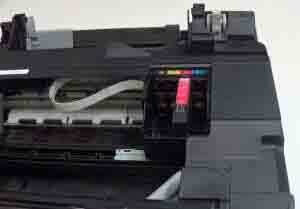 During the print head cleaning, the printer attempts to force ink through the nozzles of the printer as it tries to remove the blockage that is preventing a good flow of ink to the print head. The ink being forced through the print head is done so at a concentrated pressure and the ink volume of the cartridge may be greatly reduced as it uses ink each time to force its way though the print head and into the waste ink pad. Some home printers have the printer heads built into the printer such as the Epson XP-245 that uses the Epson 29XL ink cartridge and the HP Photosmart B109d using the HP 364XL ink whereas the Canon printer Canon Pixma MX435 uses the Canon PG540XL and CL541XL inks that actually have print heads integrated into the printer cartridge itself.